Hi beautiful :) I’m back with the second hair tutorial from my TRESemme partnership featuring three “Throw-Back-Thursday” inspired looks (click here to view the first look: Boho Beach Waves). 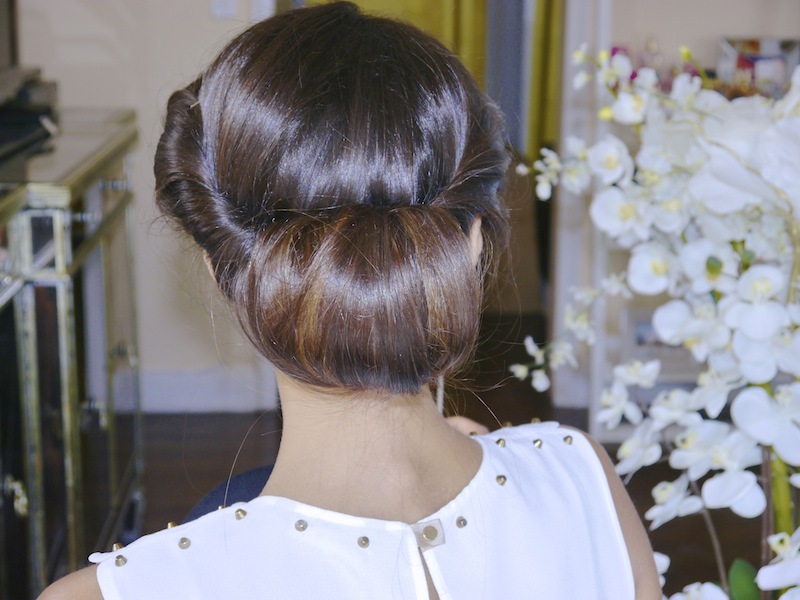 Today I’ll be “throwing” it way back to the Ancient Grecian times and showing you how to do this romantic Grecian updo! This is an effortlessly chic look, which I love wearing both during the day and at night. Even though this style might look like it took a while, it will only take you a few minutes - it's basically some twisting, rolling and pinning :) Plus, I love having my hair up as it shows off the face and neck beautifully – and it’s a must for hot days! Click below to watch the tutorial. 1. Prepare by spraying Fresh Start Color Care Dry Shampoo into roots of hair, which instantly freshens up the hair by eliminating odor and oil. It will also provide the hair with good grip. 2. Starting at the top, begin twisting pieces of hair backwards, remaining close to your head, and work your way down the side of your head, continually wrapping hair into the twist. 3. Once you arrive at the bottom of your head, pin twisted hair into place. Repeat to other side. 4. (Optional: Take remaining hair and secure in a low ponytail. Remove pins as desired). 5. Starting by the ends of your hair, begin rolling the hair upwards, making sure to tuck in the ends. Once all the hair is rolled up, bobby pin the inside of the roll to your head. 6. Using the tips of your fingers, gently scrunch and ruffle up the hairstyle, it will give it a cute bohemian messy look. 7. Finish by misting Smooth and Silky No Frizz Shine Spray to give a beautiful healthy shine to your hair. so pretty! r going to do a tutorial on the hair you wore in the fav 6 products video?? i know u are moving and all but it was a really pretty look!!! wish you all the best with moving! This hairstlye is absolutley stunning, i would love to try it! Such an elegant hairstyle, defiantly going to try this ! This look would be perfect for a wedding I'm going to in a couple of weeks. Thanks Annie - I'll definitely try it out. Although I will have to practice quite a lot before the day I think! super pretty, I'm gonna try this updo, it's very easy and chic. Can't wait to see another tutorial,haul or outfit! You're my all time favourite youtuber and blogger. I looved that hairstyle, Annie! Glad you're ok :) Was waiting for you for soo long! Wow… it loos really nice and trendy… the tutorial is precious..
Really you are so sweet and cute.